It will soon be Race Season for CableGuyPhotos. Enough of this Cold, Face Numbing, Canadian Weather, I Want Racing!!! The 2018 NASCAR Spring Race in Phoenix Arizona is going to be checked off of the lifetime bucket list. This is the last race on the old configuration at the newly renamed ISM Raceway. I’ll be sure to wave at ya from the Sunny Arizona Cactus Patch, who knows I might even find a Rattlesnake. I have been very fortunate to meet and work with many talented race people over the past decade or so and now is time to list my Top 10 Hi-lights. In 2003, Rogers Television was hired to produce a Television Series at Barrie Speedway, I was one of the premier camera operators volunteering at Rogers and was asked if I would join the racing production team. It didn’t take me long to say YES!!! Being a talented hand-held camera op, I was assigned to do pit reporting with Dave Bradley and we made Local Television history with the Centennial, Chrysler, Dodge, Jeep, Barrie Speedway Power Hour, Only on Rogers TV. It was out of the box popular and ran for 3 seasons. With a title almost as long as the show itself, this was my entry into the world of Stock Car Racing. I am fortunate and thankful for other track photographers, we are a peculiar lot and have more fun trying to take pictures of each other, mostly because we are all too ugly to be in front of a camera. I have always treated it as a friendly rivalry to see who could get the best action shot of the day, as opposed to trying to out-sell the others. Track photographers don’t make much money, especially in the cell phone camera days that we presently are in. Jerry Abramowicz, Eric Uprichard, Ashley McCubbin, Dan Little Jr., the list goes on, apologies to any that were not mentioned, there are just so many talented media people out there. I am thankful for each and every Driver, Fan and Official that has ever worked or played at Barrie Speedway. The friendships that I have made are too numerous to count. There are always the few you work with each and every week that stand out above the others, People like Jim Beleskey, Mike Langley, Mike Walker, Ralph and David Vokey, Dave Lewis, The Bakers, The McLeods, The Cunningtons, the St.Onge’s, far, far too many talented people to list everyone, but I am thankful for all of them. How cool is it to be associated with NASCAR? I am very thankful that Whelen Manufacturing puts as much into this series as they do. For our local tracks to be part of the Big Conglomerate of NASCAR brings a special kind of feeling, knowing that one day, any one of us could be playing in the big leagues. I was fortunate enough to be able to travel to Charlotte, NC to take photos at the Year End Banquet and become part of the fraternity of high end winners. I got to meet many young, up and coming drivers. Riding an elevator with a phenome like Kyle Larson, before He was Kyle Larson, is pretty special and unforgettable. I am thankful for John and Frank Casale for allowing me to play in their sandbox for the past 2.5 seasons. Having regular chats with John after everyone has gone home are a thrill. It’s like speaking with history and seeing it through the eyes of a warrior. The Casales have had the track for many, many years, and have seen just as many changes, some good, and some not so good. The place is not complete without Wendy Richardson, whom has taken it upon herself to be a “Mother Hen” to Derek Smith and I, making sure we are well fed each week, for that I can’t thank her enough. 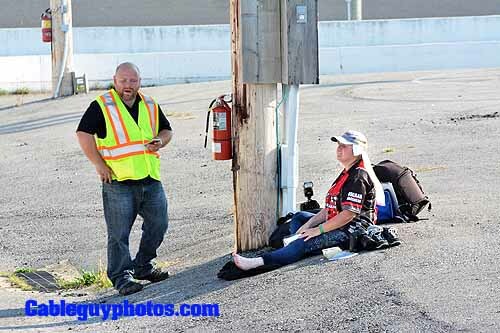 In 2010 and 2011, I was welcomed as the track photographer at a newly refurbished Sunset Speedway. To watch Mark Dilley, manage the track and carry out his duties was exciting to see. His vast knowledge of the racing industry is to be admired. If Mark was the business end, Steve Slaughter was the track management guru. Steve was very diligent in his duties, and he sometimes had to make some difficult decisions that were not always popular, but he always had a smile for Joan and me every week we were at Sunset. The fans support at Sunset was second only to the Barrie Speedway faithful and were very passionate about their track, they are great race fans. I never mentioned Derek in #9 because He deserves his own place among things I am thankful for in racing. While we have many talented photographers in motorsports racing, Derek IS the King. I have never met a more passionate race photographer in my life. He is everywhere. I still don’t know how he does it. I personally think he has perfected cloning or is an alien from another planet. He is to me, the most talented race photographer on the circuit. 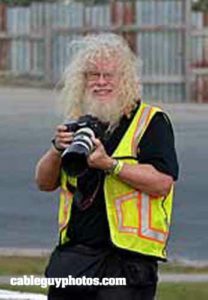 There is nothing that he won’t shoot, Dirt racing, Asphalt, Indy cars, Motorbikes, hell, I bet he even photographs rain drops running beside each other. I tip my hat to this very talented photographer that I have, thankfully, had an opportunity to work with and along side. I am very thankful that Rick & Diane were the owners of Barrie Speedway in the final few years. They were always supportive of the track even before they were owners. They started out as race fans and sponsor’s, and managed to bring the track back some respectability before it was forced to close down. I won’t get into a debate about that particular subject, but I will say to the naysayers, that Rick & Diane did all that was possible to keep BSW open and were among the very best of owners in the 50-year history of Barrie Speedway. My personal thanks to them. One of the most thankful things that ever happened to me because of racing was meeting and befriending the Bradley Family. Dave Bradley “The Talent” as he is referred to in the family is the reason I know, what I know in racing. He has always been a racer and it shows. The dude converted this once fanatical hockey guy to a full-fledged racing convert. His vast knowledge and ability to share it with me, the viewers and listeners is why he is the premier racing voice in Canada. This dude is NASCAR talent at it’s finest and the Pinty’s Series is damn lucky to have him. I’d put Dave up against any of the voice talent in the US as well. His brother Mike (Great Name, by the way) is a very smart and talented driver, car builder himself, and he too, has shown me a lot about the How’s and Why’s of car set-up. Jo Bradley, the matriarch of the family is a top notched car chief in her own right. I guess if you have two boys, three if you count husband Russ, that are all into racing you learn a thing or two. She can be found meticulously cleaning the car at every event. If they can’t run good, they’ll at least look good. Finally, Russ Bradley. This is what every Dad should aspire to be. He supports his family in their hobby and puts his money and mouth into the sport as well. He volunteers as an executive of the Outlaw Midget Racing Club, works as crew chief, sponsor getter and has been a great source of knowledge for me to glean from too. It is wonderful and I look forward to joining this family whenever I get a chance. Anybody that ever visits a track where the Bradley’s are, must come and meet them, you won’t regret it. Alright, here it is, my #1 thing I am Thankful for as it relates to racing. If it wasn’t for Brad Moran, I would not be in racing today. I’d still be taking photos, of that I am sure, but I would not have been involved as deeply as I am without Brad. As the owner of Barrie Speedway, his passion for racing was contagious. He was a hard-working person with an eye for detail. If Brad asked you to pick weeds in Corner 2, it was because He was busy picking weeds in Corner 1. He had a vision for Barrie Speedway and made that vision come true. He had the foresight to see that the local television company could help promote the track and garner interest in the area. 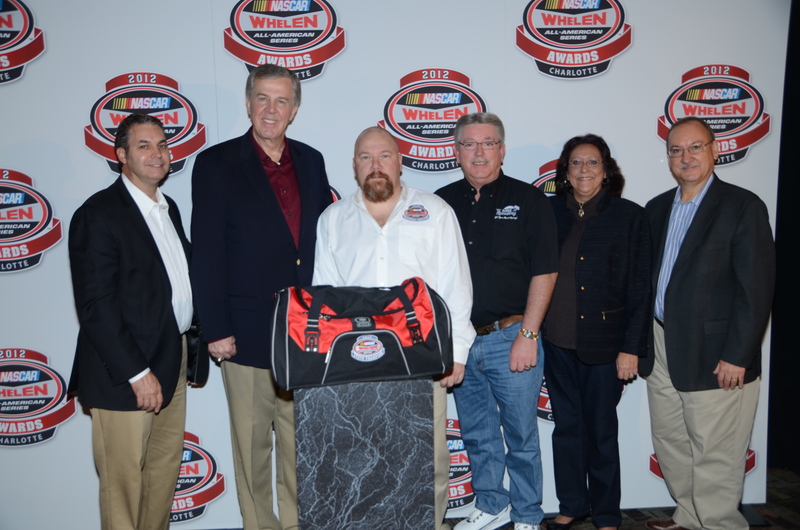 He also had a dream to attract NASCAR into Canada with the NASCAR Whelen All American Series. Brad was very successful in doing that. I was fortunate enough to meet many of the executives from that series and they were all impressed with Barrie Speedway. 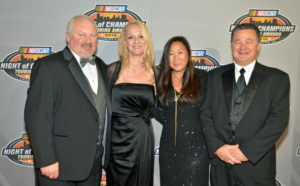 They spoke highly of the track in Charlotte during Banquet time. Barrie Speedway was a jewel in the NWAAS crown. When Brad sold the Speedway, it wasn’t long before he was brought on board with the then named NASCAR Canadian Tire Series as a director and his star has been soaring ever since. He was the international series director for NASCAR until being promoted to the NASCAR Camping World Series director, where he is currently. Thank You Brad and it is a pleasure to have worked for you and call you a friend. It was perfect weather for a night of Racing at Flamboro Speedway. Click on the Thumbnail below to see all the photo action from September 16, 2017 at the track. Be sure to visit Flamboro Speedway September 23, 2017 for Championship Night. Well, The #97 of Robin McLean actually took one on the Chin. McLean suffered an injury to his Hollywood Good Looks in a work mishap, and The Outlaw Midget Club couldn’t let him forget it. That did not mean that the racing was any softer. James had 2 Heat Victories with Bound and Carrothers splitting the other 2 heat wins. Click on Poor Ol’ Tigger to see the September 2nd photos from Sunset Speedway. 21 Outlaw Super Late Models heard the cry of… GOLD !!! at Flamboro Speedway on August 21, 2017. The Gristled Old Gear Prospectors battled hard to find the Rich Vein of Asphalt that was sure to be the way to Fortune. In the end, only one, would exit with the Riches. If you want to see what we saw, click the thumbnail below. A great night of action packed racing at Flamboro Speedway. Due to so much racing to get completed before a 11 p.m. curfew, they suspended On-Track Victory Lane photos, but Fear Not, there was a Parade of cars to Victory lane at the end of the evening and all Winners were photographed in Victory Lane. The most dramatic moment of the night was when one of the J-Cars had an incident in Corner 4. Thankfully the Injuries were minor in nature. We ain’t got no Horse N Buggy here son, Click on the Thumbnail to see some Horsepower in action/pictures. 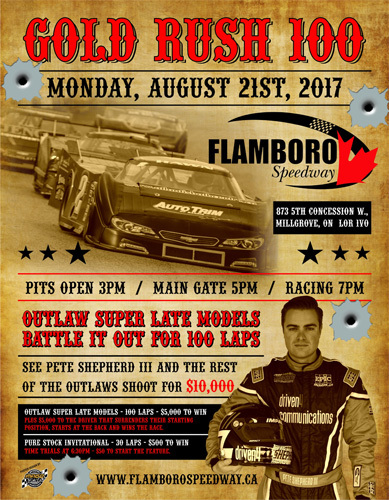 Flamboro Speedway Heats up the Asphalt on Monday August 21, 2017 for their popular Gold Rush. Don’t Ya Dare Miss It. A formidable posse chased after The #2 of Outlaw Midget driver Jessie James as she made her break away to the Checkered Border at Sunset Speedway on August 17th. In close pursuit was the #68 of Marshal Adam Carrothers and the #5 of Sheriff Jody Bound. Marshal Carrothers had actually overtaken the speedy James but displaying some fancy 360 spinning, without a caution, he was passed by the Outlaw and the Sheriff, relegating him into third. The Marshal mashed the gas and kept going, eventually passing Sheriff Bound, before Jessie James and the Rhino’s Roadhouse gang made it safely across the border on lap 25. Full pardon’s were granted all around. The race was not without some other exciting moments as well. A lap 11 mishap resulted in the #20 of “Stuntman” Jon Nebel doing a very slow roll over. No Injuries were reported but He was given a belly rub and a biscuit. Congratulations to all the Heat Winners and Jessie James in the Feature. There was a hugely popular Fan Appreciation Autograph Session just before the Feature Races. What did YOU get to sign? Click the Thumbnail above to see the rest of the Titillating photos from August 12, 2017 at Sunset Speedway. The Outlaw Midgets next race date is August 26, 2017 at Sauble Speedway. The August 5th weather start did not look very promising, but Mother Nature strapped on her Race Fan Wings and let the Racers Soar to some Glorious Competition at Sauble Speedway. With a Jam-packed parking lot, looking more like an RV Sales lot, the crowd was treated to some Fantastic racing. The Outlaw Midgets put on a Super show with some great side by side racing on both days. Congratulations to #5 Jody Bound on winning both features. Click on #5 Jody Bound and see all the photos from Sauble Speedway on August 5th & 6th. Next Up for the Outlaw Midgets is Sunset Speedway on Saturday August 12th.